This week I had to give up something that meant a lot to me: becoming a teacher for my cousin’s fitness brand. It was a hard decision that I didn’t make lightly. Now, I was terrified that my cousin was going to hate me for it. Why? Because I hated me for it. I hated myself for not having the drive to ‘do it anyway’, hated myself for ‘giving up’, hated myself for quitting. Still kind of do, even 2 days later. Forgiving myself completely might take a while. Would it hurt, business-wise, that I’d no longer be available to teach? Yes. Because she had begun to put together classes in my area. But did she blame me for the decision I had to make? Because at the end of the day, I have to find that thing- my thing- that makes me want to get up every morning and do it all day long until I can’t go anymore… and then keep going. She then went on to remind me that even as a successful businesswoman, she STILL experiences moments of doubt and insecurity. It’s always a relief to hear that. Especially from someone who I see as so strong, persevering, and unyielding. Like, this chick don’t quit… ever. She’s got 3 kids of differing ages and stages of development (the oldest is 15, the youngest is 2), she’s got to run this business and handle most of the promo, make sure the bills get paid, and STILL somehow make time to take care of herself. I’m totally in awe of her. Anyway, hearing that she deals with all that and STILL sometimes feels like she doesn’t do enough really helps me let myself off the hook. Uncertainty isn’t a character flaw, it’s a normal part of life. You could be the most successful woman on the planet and never realize it because you’re just trying to survive yourself. It gives me reassurance that just because I don’t feel like I’ve ‘made it’ doesn’t mean I haven’t accomplished things. And moving on from things that don’t seem to be fitting in with my journey isn’t a failure, either. According to the Cambridge Dictionary, self-discovery is “the process of learning about yourself and your beliefs”. (source) Pretty straightforward definition, right? But there’s a little something I’d like to point out: “the process of…”. It’s not the moment when you actually find out who you are. That would mean that you’ve reached the end of your journey… which probably means that you’re dead. In my opinion, self-discovery is a combination of those 2. You don’t really start a process without the intention of achieving some kind of result… that would just be redundant. But you do tend to start new things naturally. When they don’t come naturally, they gradually shift themselves out of your life (if you let them). Ugh. No. Nobody wants to deal with that. You’ll get to a point where you even make yourself sick. Change is a good thing. It helps us grow. Ten years from now, you’ll be in a completely different place than you are today. You’ll want different things, like different things, know different things. The trick is to learn to be ok with this. Sometimes things die- people, feelings, passions… and yes, it’s really, really sad at first. But it’s going to be ok. If you let it, something greater might come along. It’s OK not to know who you are yet. In fact, it’s OK not to know exactly who you are ever. 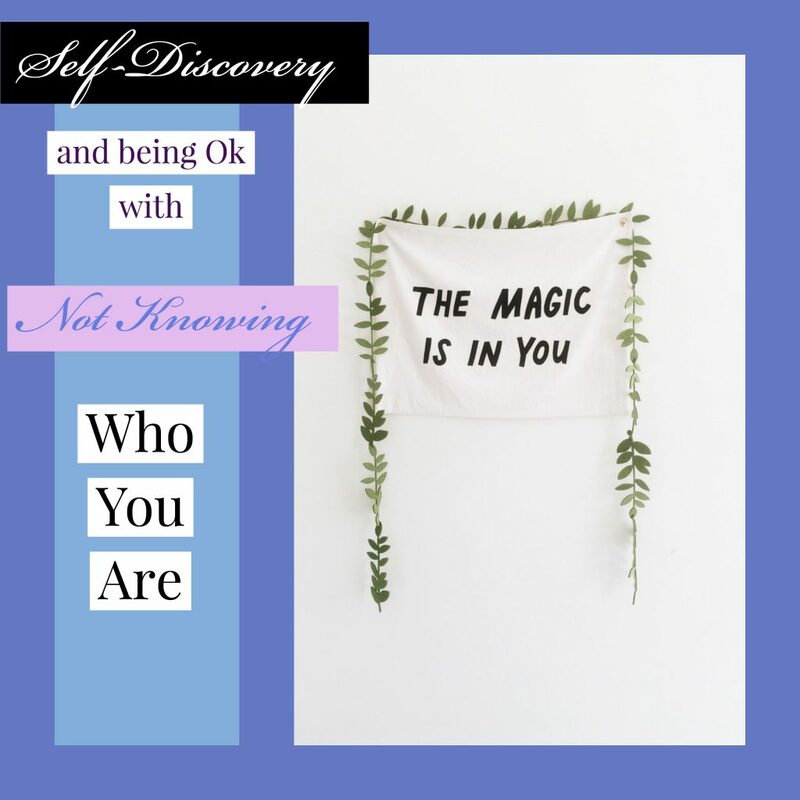 During your self-discovery process, you’ll reach several ‘results’ or ‘destinations’… then be met with a whole new set of challenges and have to start another process to overcome those. By the end of each process, you’ll find out something new about yourself. And that’ll become part of who you are, too. Trying things and finding out they’re not for you is ALSO OK. This goes along the same lines as ‘finding out new things about yourself’. Like I was talking about in the first paragraph, I thought I would really like teaching for my cousin’s fitness brand. I like to work out, I like to dance (which it has a lot of), and I like to perform. Seemed like a match made in Heaven. But as time passed, I found that I just wasn’t getting the same joy out of it. It’s nothing to do with my cousin OR her brand… in fact, I’ll probably still take the classes if I can manage the drive time. Everything about it is great. But I could just tell that this wasn’t going to be something I could see me doing in the future. Like losing a partner or a friend, it hurt to have to give it up. Just because I didn’t love it doesn’t mean I won’t miss it. But ultimately, I know it was the right thing to do. Now my cousin can focus on her brand and the people that are passionate about teaching instead of on trying to get me to events. And I can focus on writing these blog posts for you :), which is something I really want to do. Changing your mind is NOT failure. Just because something didn’t work out doesn’t mean that you failed. You are not a waste of space just because you’re good at something but don’t love to do it. If you couldn’t tell by the name, I’m a singer ;). And I love to sing; that hasn’t changed. And it’s no secret that I love to write, too. But the way I want to use my voice and my writing has changed. Initially, I saw myself as a singer-songwriter who wanted to make it in the popular music market. I’d do my best to create songs and a sound and an image that would sell. And it killed my passion for it for a while. I felt so lost when it started to happen; it wasn’t something that happened overnight or in an instant. It was a slow, painful process of feeling the motivation drain out of me. Major suckfest. I was not a happy person in this time in my life. But it was this same unhappiness that made me think to start this blog in the first place, which I’m considering a major win. And the great news is that my break away from music and singing has given me room to start exploring it in a new way. So I’m not considering my loss of desire for a career in the pop music market a fail. I’m considering it a win. It’s the reason why I’m alive and writing this post today. Let self-discovery be what it is– a discovery. In order for something to be a discovery, you can’t have seen or experienced it before. Discoveries are new things… they’re things we didn’t see or know existed before. Therefore, you can’t really expect yourself to predict it. The point would be moot. So don’t even try. Self-discovery may be in familiar territory, but the things you find may not be familiar at all. What have you discovered about yourself recently? If you’d like to receive updates from me in the future, please subscribe to my mailing at the bottom of the post! 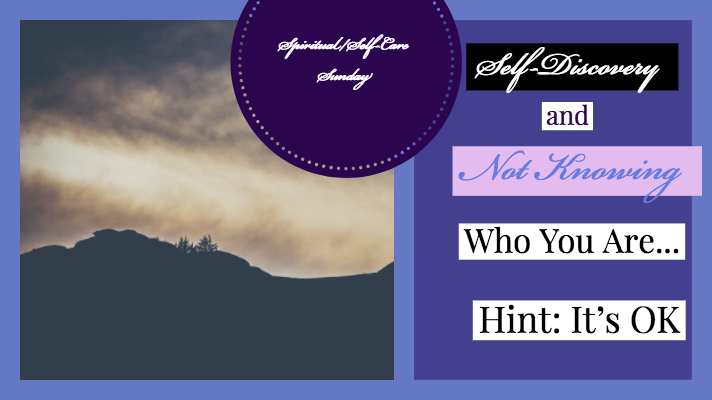 Psychology Today, Self and Self-Discovery: Who am I, really?